THE AUDIENCE at a preview performance of Haunted America Suite wasn’t expecting actual ghosts. But as an eerie movement came to a close, everyone packed into Atkinson Recital Hall at New Mexico State University witnessed an event that—whatever its origins— definitely wasn’t planned. Technical glitch or ghostly prank? Now listeners can decide for themselves. 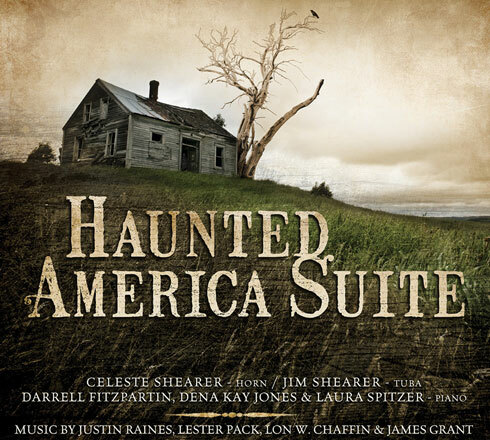 Haunted America Suite (Summit Records, 2015) features five musical suites—including the spooky title set—that offer a well-balanced selection of spellbinding music. Compositions like “Why/Because” by James Grant, “Faraway Nearby” by Lon W. Chaffin, and “Suite for Horn, Tuba, and Piano” by Lester Pack give the album depth and diversity of moods, often leaving the spirit world behind to engage with Spanish folk music and even jazz. Shearer plays tuba on all but one of the 17 pieces, while his wife, Celeste, plays horn; a rotating cast of pianists rounds out a trio. The three instruments provide the palette for conjuring ghosts as well as landscapes, and references to the Southwest are inescapable. As Shearer points out, the album enjoyed a long incubating process in New Mexico. Raines, the composer who wrote “Haunted America,” built his career at NMSU, and Chaffin is currently head of that school’s music department. Several of the other performers, as well as the producer, Steve Haddad, are current faculty or graduates. Chaffin’s “Faraway Nearby” is a sensitive portrayal of the desert landscape that doubles as an homage to Georgia O’Keeffe. The suite achieves some of the same effects in music that O’Keeffe achieved through paint—geometric simplicity, gradient colors, butterfly specks of movement across a sun-baked plain. “Haunted America Suite” is a similarly evocative set of pieces, which opens, fittingly, with “La Llorona,” a popular Southwestern legend that tells of a woman who drowns her children to win a soldier’s love. Raines’ suite begins with her ghost calling plaintively for her children—as she is said to do even today. From “La Llorona,” the music travels to Gettysburg on the fateful day of the battle, then to the plains of Oklahoma, and finally to the South, for “The Bell Witch.” Raines tells stories through his music, interweaving folk songs and hymns as themes in a style reminiscent of Aaron Copland. These songs are sometimes distorted for effect, as when “The Bell Witch” incorporates the hymn “Blessed Assurance” in a frightening minor variation. The virtuosic composition is matched by the musical ability on display throughout the album. “These pieces are hard,” Shearer admits. Both he and Celeste point to the last group of pieces, Pack’s “Suite for Horn, Tuba, and Piano,” as especially difficult. This suite includes the ephemeral “Santa Fe Fantasy,” inspired by a trip to that city, and the swirling tune “Chacona Mulata,” based on a mysterious New World dance. “When you see the music in front of you and you think, ‘I have to play that,’ it’s hard not to be intimidated,” Celeste says. For Jim Shearer, the musical challenges are definitely worth the effort—especially when the results are so striking. “I’m always interested when I go, ‘Wow, I didn’t know a tuba could do that,’ ” he says. People don’t always think of horn or tuba as melodic, expressive instruments in their own right, but the album aims to break popular preconceptions about the role of brass instruments in classical music. Speaking of which, ghost enthusiasts might want to lend a close ear to “The Bell Witch” at the five-minute mark. There’s an audible door slam. “The performers don’t remember hearing it,” says Raines. “Nobody caught it until the final mix.” For Shearer, who has championed an approach to recording that captures the spirit of a live performance, the surprise vindicates his musical philosophy. Ghost or not, it’s proof that the unexpected can be haunting. Haunted America Suite is available from Summit Records and other retail outlets. For information on Jim and Celeste Shearer’s tour schedule, which includes an Oct. 31 performance at UNM’s Keller Hall (505-277-4569; music.unm.edu), visit tubashow.us. Las Cruces is home to a vibrant classical music scene. NMSU’s Atkinson Recital Hall holds 400 events a year, including orchestra recitals, large group ensembles, student performances, the Doña Ana Lyric Opera, and chamber music. There are several symphonies active in the area, including in Las Cruces and Roswell. For more borderland art music, check out the following: La Catrina String Quartet (lacatrinaquartet.com); Las Cruces Symphony (lascrucessymphony.com); NMSU Department of Music (music.nmsu.edu); El Paso Pro-Musica (elpasopromusica.org); El Paso Symphony (epso.org); and Southwest Chamber Winds (swchamberwinds.org).